Researchers from imec’s associated lab at Ghent University have invented an innovative way to fabricate shear sensors for use on flexible surfaces, such as human or robotic skin. 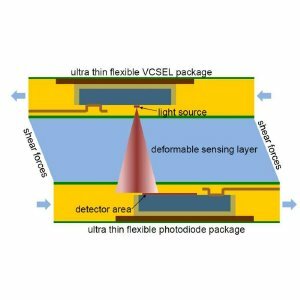 The new sensors are based on optical technology embedded in thin flexible substrates. Shear sensors measure shear stress, i.e. stress that is applied parallel to the surface of a material, as opposed to a stress that is applied perpendicularly. Most shear sensors are based on micro-electromechanical systems (MEMS), and are fabricated on rigid Si substrates. These sensors can have a high density and sensitivity, but they are fairly thick and lack flexibility. Moreover, their activity is based on electrical measurements, so they are sensitive to electromagnetic interference. Schema of the sensor stack, with the silicone layer deformed through shear stress. There is a substantial demand for sensors that can measure shear stresses unobtrusively. These would have to be compact and flexible, so they can be used on moving body parts and wrapped around curved surfaces. The demand comes especially from the medical community, which would use shear sensors, for example, for measuring the skin friction between a prosthesis and stump. But they could also be used in other application fields. In robotics, for example, flexible shear sensors could help to create a sensitive artificial skin. Imec researchers have recently reported on a way to fabricate such flexible shear sensors using optical technology. Optical sensors have a high sensitivity, a large dynamic range, and are not susceptible to electromagnetic interference noise. Furthermore they can be embedded in flexible substrates, making them potentially very compact, robust and flexible. The innovative sensors are made with a process that allows embedding optical components into very thin and flexible substrates (down to 50µm). One such sensor is a stack consisting of a vertical-cavity surface-emitting laser (VCSEL) source and a photodiode separated by a transparent deformable layer made of silicone. In the stack, the VCSEL and photodiode face each other and are aligned so that the photodiode captures most laser light when there is no shear stress applied to the stack. When shear stress is applied, the laser and the photodiode move relative to each other. The change in laser light captured by the photodiode is a measure for the shear stress. The prototype sensors were made using a layer of the silicone material Sylgard 184. The deformation of the silicone material showed a linear response to the applied shear stress. In a next step, the researchers are working to adapt the sensor design so that it can also indicate the direction of the shear stress.